Bernie Taupin considers himself a storyteller. As a visual artist for almost two decades, this installation highlighting new mixed media works at Chase Contemporary continues his ongoing narrative with American culture. His professional concentration has been on mastering visual productions: portraying powerful motifs in a coalescence of string, spray paint, wood stain, pop- art, and more. He also conveys emotion through color and form, rending abstract expressionist imagery inspired by Mark Rothko, Jasper Johns Robert Rauschenberg, and Barnett Newman. Although born in the United Kingdom, Taupin has considered California to be home for over half of his life. As an American citizen, his recurring use of the United States flag pays tribute to the American West, musical pioneers, and urban environments. He cites all of these musical pioneers and urban environments. He cites all of these influences as heavy inspiration for all he does and as patriotic reference of the freedom he respects and appreciates. Bernie Taupin has made a name for himself not only with his lyrical projects but also with his visual artworks. He’s amassed a repertoire of over 45 albums with his musical partner Elton John, who together are responsible for penning classics such as “Tiny Dancer,” “Rocket Man,” “Candle in the Wind”… and the list goes on. When asked about what fuel his creative inspirations, this accomplished multi-talented artist often comments that his art creations are merely the visual manifestations of his lyrics. This recent series of compositions combines all of those diverse elements - everything that together creates the quintessential texture of America. 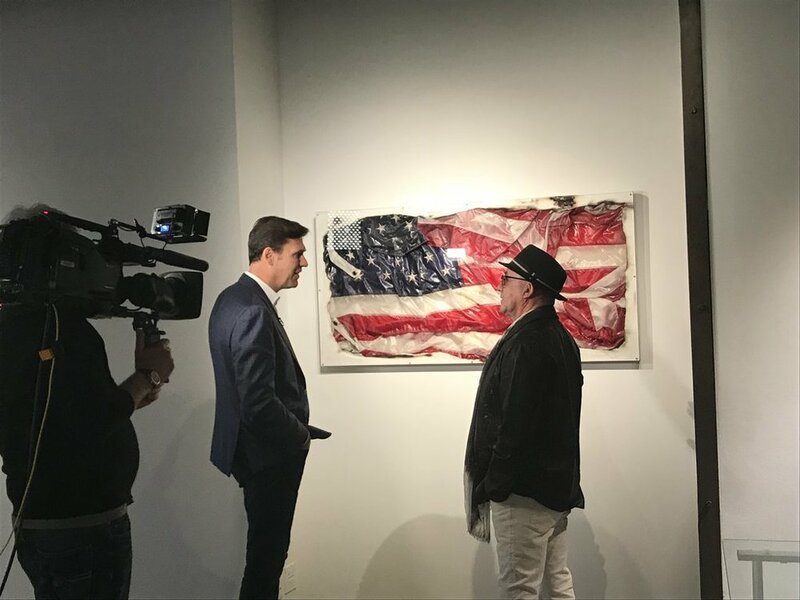 CBS Sunday Morning interview with Bernie Taupin and Lee Cowan at Chase Contemporary Gallery airs on April 8th! The complete artwork for the film comprised 240 hand colored paper cels for the short film ‘She Said So’. Drawn by Stephen Verona and hand colored by Verona & John Lennon. Each measuring 8.5 x 11 inches. A chance meeting in a London nightclub in London in 1966 between artist and film maker Stephen Verona and the man of the hour John Lennon led to an artistic collaboration which resulted in this, the world’s first music video. John gave Stephen the hit song, which arrived on an unlabeled tape. It sounded like the title of the song was going to be ‘She Said So’ not the next line in the song, ‘I Feel Fine’ hence the title of the video became ‘She Said So’. Verona set to work in New York drawing the pop-art cartoon images illustrating the lyrics. Each word had a drawing. Lennon flew to New York and the two got together to measure the progress. Stephen remembers the night that Lennon came over to his apartment and the two wiled away the hours by sitting at the dining room table and coloring in the images with magic markers – the first rock and roll Music Video was born. It was a smash hit. The film was shown at the Museum of Modern Art in New York, and went on to win awards at the Atlanta, San Francisco and Chicago Film Festivals. It won the CINE Golden Eagle and went from there to many of the major foreign film festivals. An original print of the film resides in the Library of Congress archive in Washington D.C.. These hand drawn and hand colored original cels are unique and no other copies exist. They comprise both a milestone in music video history as well as an important step in the history of the Beatles.